2008 Chris-Craft Catalina 23 The Catalina 23 is known for Chris-Craft's classic design with the deep v-hull and flared bow, ensuring your guest have a smooth, dry ride while aboard. 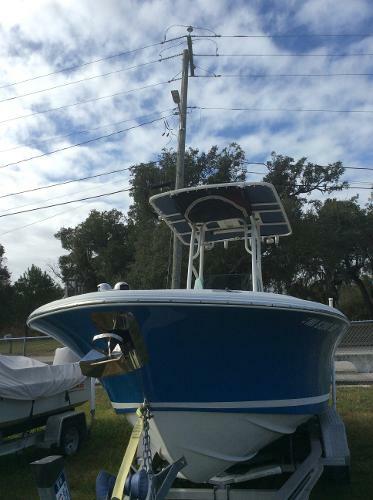 This unique center console is not only for the serious fisherman, but also equipped for water sports, the whole family can enjoy. 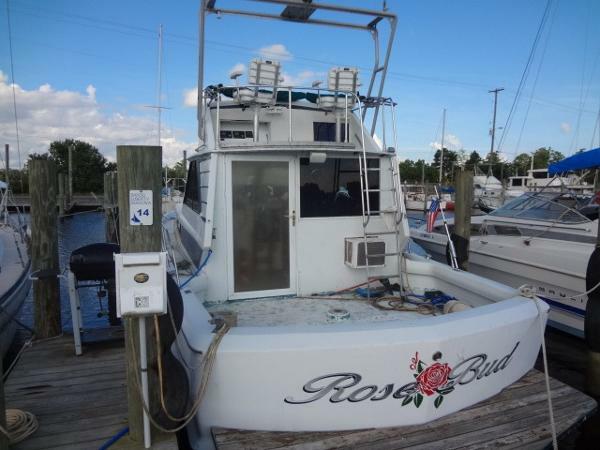 For the fisherman, a 36-quart cooler, two fish boxes, 20 gallon live well, cockpit combing pads, and gunnel rod holders. For entertaining family and friends, there is spacious bow seating w/cushions, console seat leaning post, fold away aft seating (accommodates 8), Kenwood Stereo and porta-pottti. Swim platform and bow deck feature a beautiful teak inlay, only adding to the already distinctive style. 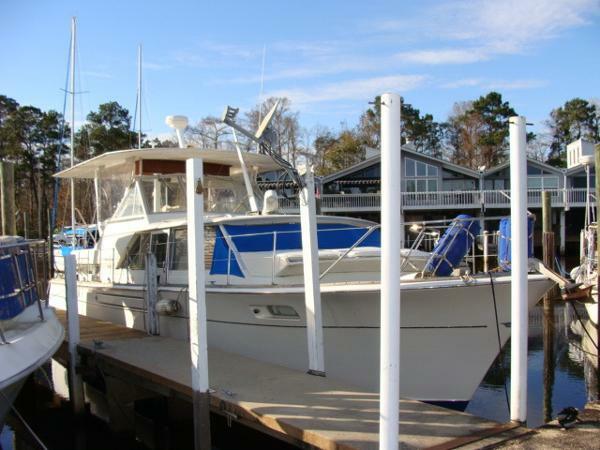 The Catalina 23 will meet & exceed your needs! Don't pass up this opportunity. Before you know it the boating season will be upon us, so buy now and be ready for spring boating. 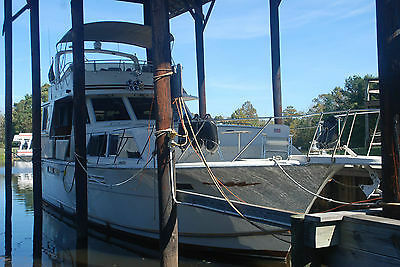 1969 Chris Craft Commander M/V Goodnight Irene is the classic style, family cruiser that makes true mariners smile. The center-line helm station is on the upper deck giving the captain greater visibility in docking and finding landmarks. The wrap-around deck makes navigation for and aft easy without compromising deck space . Center companionway door leads to an open salon with natural lighting from the wrap around cabin windows. The starboard side deck sliding access door is so convenient that is has been copied by other manufacturers . 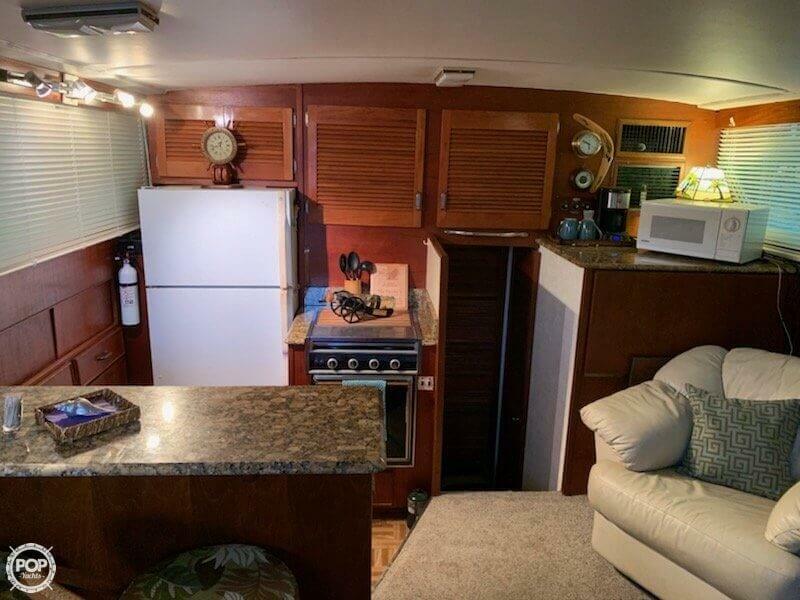 The fully equipped galley down has a salon breakfast bar with bar stools. Peace and quiet provided by having two staterooms on opposite ends of the boat with separate heads makes it easy to invite family and friends. The overall floor-plan was obviously designed with knowledge that only past experience can bring. The Term "Ample Storage" would be an understatement here and the modern phase "user friendly" actually applies. Excellent for over-nighters, weekenders, and live-boards. 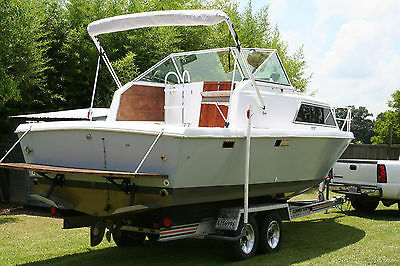 For sale is a 1981 Chris Craft 251 with swim platform. Overall length is 28' and beam is 9'. On the trailer she's 10'2" for clearance top to bottom. Length of the boat and trailer is 30.5' and 9.5' wide. The hull is in average condition with scratches and chipped paint , but is a dry hull. No leaks. Shaft seal has normal leakage. There are 3 bilge pumps installed. Stock bronze prop and a spare are included. Shaft and cutlass bearing in good shape. Rudder and shift cables are recent replacements. Swim platform was repaired with some oak but is mostly teak and was varnished and sealed. Hull fittings and general hardware are mostly original and in working condition. Doors, cabinets ,drawers, etc operate. Original ice box, sinks x2, thetford toilet w/pump and tank all work. A pressure potable water system with 20 gal tank and cockpit shower hose all work. Cabin has new cushion covers and the wood work looks good. Head liner was removed,but not replaced. Led lighting installed throughout cabin, engine compartment , and navigation lights.Gauges and switches operate well. A gps/chartplotter and a 2 way radio are installed. The engine is the original gm small block reverse rotation and a paragon transmission. The engine had a valve job done last year. All pumps, hoses, manifolds,risers,and alternator were changed. Carb was rebuilt. I'm including another carb in the sale. A larger oil pan was installed and a distributor with new wires also.New electric fuel pump and tank installed 2yrs ago. This is not a high performance boat. Good in big lakes or bays,or for spending a few nights on the water. Anchors easily and not very heavy. I launch and retrieve her by myself. The trailer is excellent. Everything has been gone through on the trailer. From led lights to new coupler, its in good shape. 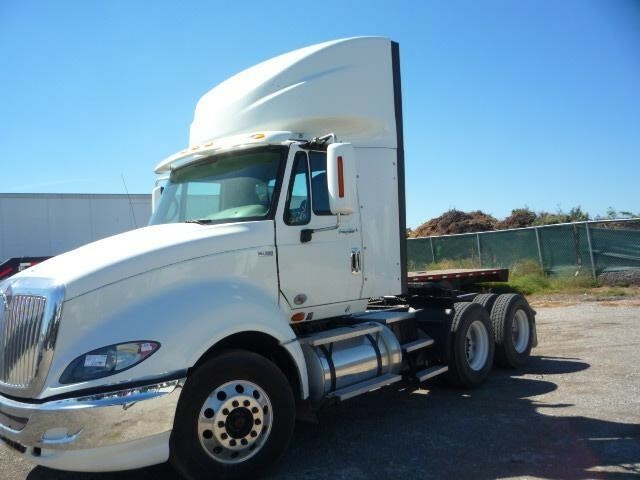 I would't be afraid to haul it anywhere.